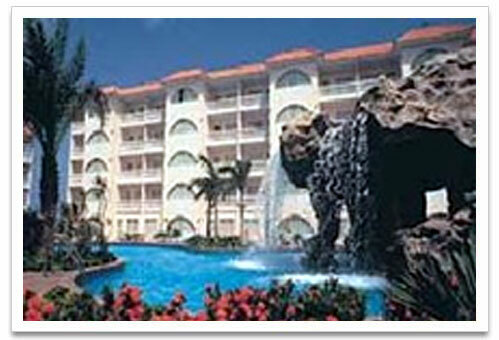 La Cabana Beach and Racquet Club is a luxurious resort across from beautiful serene Eagle beach. This resort has 811 richly furnished spacious suites with a large private balcony or patio. There are three large tropical pools with a swim up bar, waterslide, whirlpools and saunas. The facility has five lighted tennis courts with a tennis clinic. There is a squash and racquetball club and a state of the art Fitness Center for the guests. La Cabana has the Cabana Nana Club for kids and a Teens program. This resort also offers a comprehensive water sports program. In a wing off the lobby are several shops, a mini-mart, and a moderately priced cafe serving breakfast, dinner, and pizza to go. Lunch is at the poolside cafe. There are other restaurants & Theme Nights at La Cabana. There is a video arcade, laundry facilities, and spa, as well as a Car Rental desk. *Royal Cabana Casino and Tropicana Theater with live entertainment is located on the premises. These suites have ceiling fans and are fully air conditioned with private balcony or patio. They are completely and tastefully furnished and include a fire sprinkler system. There is a fully equipped kitchenette with microwave, refrigerator, stove, coffee maker, pots, dishes, toaster, blender and more. Each suite has satellite TV, a whirlpool, radio alarm clock, hair dryer, telephone, and Safety Deposit Box. Each unit has daily maid service. There is an in-room safe. *La Cabana Beach & Racquet Club has been undergoing renovations.